For the first time in a very very long time I have (shhh) writer’s block. Writer’s block doesn’t really exist: if you write every day, even if it’s rubbish, the ideas keep flowing and eventually a good story comes. But I haven’t been writing every day. In fact I haven’t written something new since I penned a story for my niece back in April. I’ve either been editing existing works or doing other stuff. Knitting, gardening, moving all the downstairs furniture to make room for the decorators coming next Tuesday. But it’s November. It’s Nanowrimo time. My audio-typing work is done, the children are back at school. I should be able to bang out a 50,000 word manuscript in four weeks. I’ve done nearly that much in four days before. But the blank page is defeating me. Dog walking isn’t generating ideas like it should. My brain seems semi-comatose. I can’t even get the kids to give me ideas. My son wants a story about Ninjas or Minions, or he wants to write it with me (! ), and my daughter isn’t interested in stories at all. I even embraced technology, instead of giving in to my technophobia, and purchased a bluetooth keyboard to use with my super-duper new phone. That way I don’t even have to worry if the laptop has charge. But nope. Still nothing. November is four days old already. Nano is happening all around me. I get the Cambridge Nano Facebook updates and people are hitting 10,000 words already. I haven’t done Nanowrimo for years, but I’ve not forgotten that it’s what got me writing novels in the first place. Actually I think partly what’s triggered it is the feedback I got from Mslexia after failing to make the longlist with Dragon Wraiths this time (it made it a few years ago). Their view was that too many stories start in predictable places: school, home. All my children’s books start in one of those two places. It’s hard to think of something else without plagiarising the fabulous books I’ve read or am reading. Maybe I’m just trying too hard. When I started my first novel all those years ago, I proper-pantsed it. I had no idea, no character, nothing, just a free-write from a bunch of items on a table at college. Now, though, I know the hot mess I get into pantsing. I need to at least know my character, setting and end-goal. At the moment I can’t even come up with one out of three! Nothing, zilch, nada. I refuse to believe in Writer’s Block, but perhaps I can accept that everything has a season, and my season now is home-maker and knitter-extraordinaire. That blank page still hurts though. For me the most effective way through writer’s block is to become like my three-year-old and son ask questions. “Mummy, why?” is something he repeats ten times a minutes and, as infuriating as it is, it’s how he learns about the world around him. Most of my answers start with “I don’t know, maybe because…”, or, “Let’s google it”. Working out what’s going on in a new novel is no different. The more questions you ask, the better the story gets. The harder you search for answers the further you get away from clichés and predictable plot lines. But when asking what happens next and why comes up with nothing, you can start questioning the characters instead. What are their motivations? What are they yearning for, even if they don’t know themselves? What are their greatest fears? What might happen to chuck them out their comfort zone. Like many younger siblings, my protagonist George is looking for his own identity. He knows he isn’t smart like his sister or sporty and musical like his brother. He thinks his mum doesn’t love him, that he’s always useless. Only his dad understood him, and he vanished a year ago. The thing he likes to do most is kill aliens in his computer games. But he also likes to cook. As the story progresses, George is discovering he’s fitter and smarter than he thinks he is, and his cooking ability is earning him respect. But, now that I’m at a dead end in the plot, I’ve been questioning him to see if he can help me work out what happens next. And he’s reminded me he loves computer games, which means he is observant and tactical. If the games he plays are like the Tomb Raider games I loved as a teenager, he has to work out puzzles and keep trying until something works. He must be tenacious and brave and good at lateral thinking. So far his co-protagonist Merula has been leading them both and making the decisions. They are in her world and she has the answers. But he’s been challenging her thinking, questioning things she’s always believed in, and now they’re at an impasse. I think it’s time for George to come into his own and develop a clever strategy to take the action forward, using his game-playing skills. Now if only I knew what games ten-year-old boys are playing these days I would feel on more solid ground. Any ideas? It’s amazing how the act of trying to think up a brilliant idea can bring on Writer’s Block. Normally I don’t suffer from anything like writer’s blankness, only writer’s fatigue. You know, when even you are a bit sick of your characters and the woes that continually befall them. I’ve never opened my laptop on a writing day and failed to write five hundred words, even if the quality of said words means they’ll be on the cutting room floor at some point in the future. (Or not, as is too often the case. I’m a terrible editor.) Today, though, after finally locating dry wellies for the children and packing them off to nursery, grateful to finally be writing after missing Monday due to the bank holiday, I came up against the wall of the blank word document. I was sat in a car park, waiting for someone I was due to have a meeting with, and I tried to at least freewrite about my surroundings. Describe the wind through the trees or the wall surrounding the car park. I managed a painful two hundred words before giving up in disgust. The thing is, I know the cause. It comes from my desire to enter the Bridport prize. Suddenly I’m back to the person I was four years ago, before I discovered freewriting with the OU, before I was introduced to Nanowrimo, before I was given permission to just write, without peering over my own shoulder critiquing every word that appears on the page. Because, of course, just writing isn’t going to be enough for a Bridport entry. It needs to be a moving or clever story with compelling characters and amazing momentum. The kind of story that lingers long after you’ve finished it, that hovers round your mind and raises new thoughts, new questions. 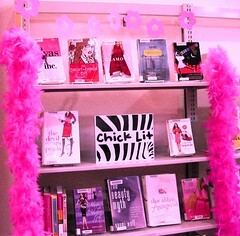 Chick Lit, now, that’s easy. It’s genre writing; there’s always somewhere to start. But coming up with something original, something unique enough to get through round after round of vetting? I’ve as much chance learning how to fly. I’m not even sure I can write good chick lit because I’ve only sent my novel to one agent so far, and I know that my synopsis doesn’t do the novel justice. I think it is time to focus, stop faffing, concentrate on what I can do, and put dreams of £5000 prize funds and fame and glory away for another year. Besides I have a synopsis to write.